Make That Sunny Spot in Your Landscaping Come to Life! Note carefully that the present list is meant to be distinct from that I've composed for drought tolerant perennials. Some of the plants below will hold up well under dry conditions -- but not all of them. Performing well in the sunshine with sufficient water is quite a different matter from a perennial's tolerating dry soil. Beginners sometimes conflate these two characteristics. There are many types of salvia. Some are perennials; by contrast, the widely grown red salvia plants are annuals. The perennial type in the photo is Caradonna. It has dark flowers like those of May Night, but the spikes are narrower, giving them a more delicate appearance. Both differ in color from Blue Hill, whose flowers are lighter and, true to its name, more of a blue. As for all of the flowers listed below, you can learn more about salvia by using the link above the image. I use Montauk daisies (photo) for late-season floral color. By cutting them back during the summer, I not only keep the foliage more compact, but also delay blooming -- until fall. If white isn't your thing for a flower but you like daisy-style blossoms, another option that's a perennial for sun is black-eyed susans. Delphiniums are one of the more striking plants on my list. Not only do they come in some eye-catching colors, but they also stand out because of their height. 'Summer Skies' is the cultivar in image, but I grow a darker type: 'Black' Knight. 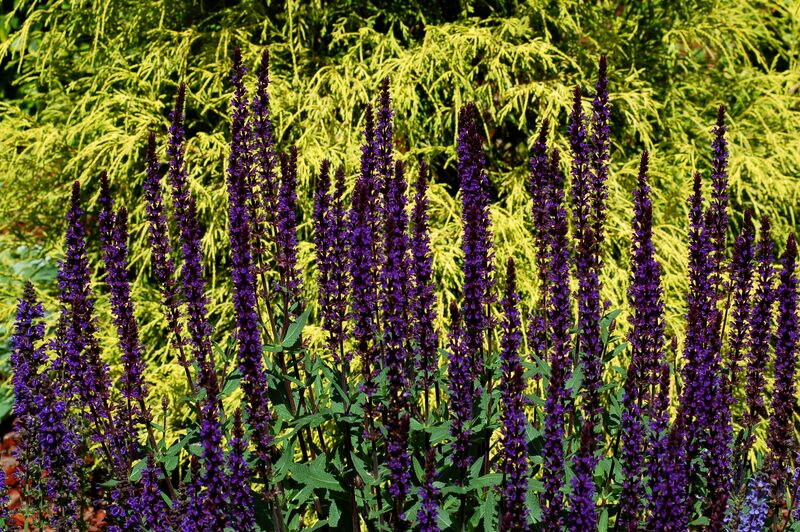 Other perennials for sun that are tall -- and therefore well-suited for display along a fence line or in the back row of a layered flower border -- are hollyhocks (although they are only short-lived perennials, at best) and Italian bugloss (another short-lived plant). Centaurea montana is a perennial type of bachelor buttons. The cultivar pictured at left is 'Amethyst Dream.' These plants should not be confused with the annual bachelor buttons, which is classified as Centaurea cyanus. What I value most about Centaurea montana is the delicate structure of its flowers (their color would be a close second; this perennial for sun also comes in blue). Juxtapose them with a coarser-textured flower such as Stella de Oro daylily (see below), and you create a wonderful contrast. You may be most familiar with the traditional purple coneflower, but other colors are available. I grow an orange kind (picture). My one complaint with the coneflowers in my landscaping is that bugs love to chew the petals up. But goldfinches love the seeds -- a tradeoff with which I'm willing to live. I love the fact that Stella de Oro daylily blooms so long and requires so little care. This perennial for sun is a workhorse, plain and simple. Of course, if you're not as partial to workhorses as I am, you might find an objection to this daylily in its very popularity (some find it "overused"). But if you don't mind growing the same plant that someone else down the block may be growing, give this workhorse free reign and it will keep on plowing -- with little supervision from you. Kniphofia. We sticklers for detail are glad that the plant owns other monikers, since not all types are red. One cultivar that is, indeed, red is called 'Redhot Popsicle,' which is part of the Popsicle series. The plant in my picture is 'Mango Popsicle.' These South African natives (don't worry, they're hardy to zone 5) give quite a different look in the garden, with their oddly-shaped flower spikes. 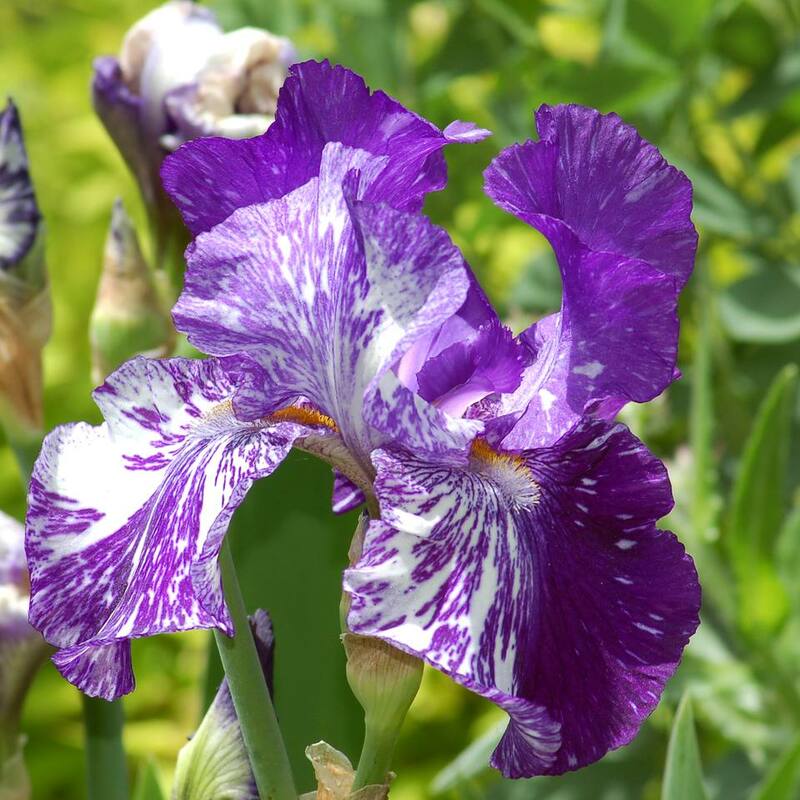 When mention is made of old-time favorites, bearded iris is often part of the conversation. Partly what has made them so well-loved for so long is that they are very fragrant flowers (well, at least some kinds). Add to this trait that they're such visually appealing flowers and it's no wonder that they've been admired for generations. The Batik cultivar is one of the prettier types, bearing bicolored flowers. While not all of the perennials for sun on my list tolerate drought well (see the next entry), 'Chocolate Drop' sedum does. That's hardly surprising, since this plant is one of the succulents. Many members of this group like a sunny spot and relatively dry soil. Another examples is prickly pear cactus. In contrast to the succulents (above), the perennials for sun with which I conclude this list need to be in moist soil to thrive. A patch of creeping phlox (image) flowing down a slope and/or tumbling over a stone wall is one of the wonders of spring (the season in which this ground cover blooms). Joe-Pye weed blooms closer to the opposite end of the growing season. In between, let hummingbird magnet, bee balm grace some sunny spot in your landscaping. You may also be interested in the best perennial vines for sun. When Should You Divide Perennials?